The past week has been a stomach churner for any investor watching the equity markets. And I wouldn’t count on things settling down just yet. So much for the typically quiet August I expected. Pointing out that this sell-off was long overdue, given that the US equity market has gone up for more than three years without a routine 10% decline, is of little comfort. While last week’s decline was sudden and felt enormous, historically declines are often like this. The bigger picture is that the US equity market has been very good to investors since the financial crisis. 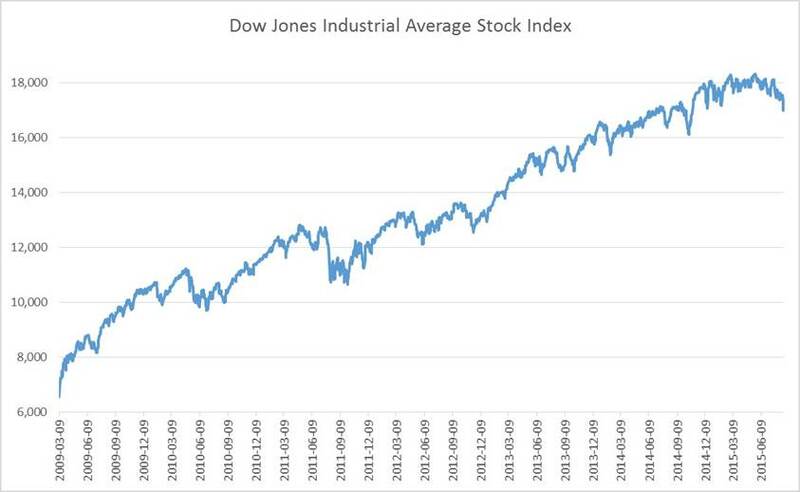 Anyone who had the stomach to go “all in” in early 2009 has earned more than a 160% return, before dividends, even after last week (see DJIA chart below from March 2009). From the 10,000 foot perspective I think is essential to adopt, last week’s declines in the major US market indices hardly register at all. But I suspect the question most will ask is whether the market continue to fall and if so how far [NB: this was written Sunday]. The likelihood is that markets are undergoing that overdue “correction,” the term pundits use for a decline of 10-20%. Could it get worse than that? Sure, but that is a less likely result. 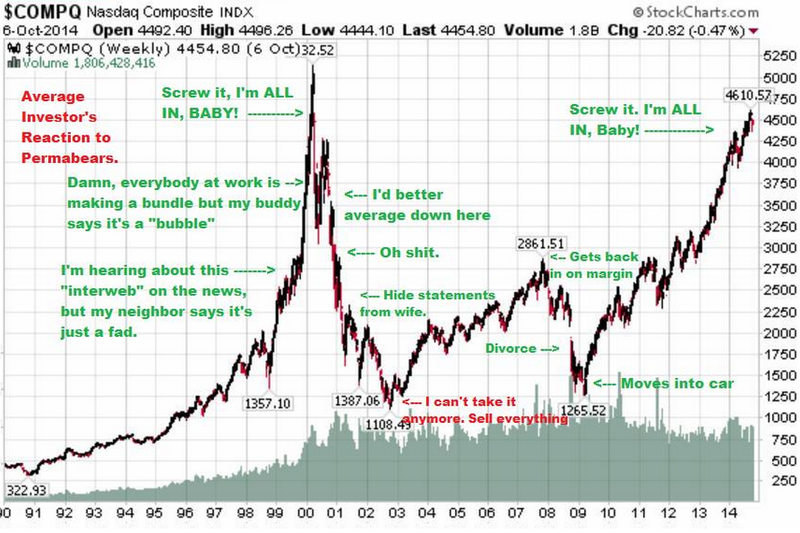 Whatever happens, CNBC and its counterparts in the print and electronic media will be weighing in on “WHY THE MARKET SOLD OFF” and “WHAT INVESTORS SHOULD DO NOW!” That is how they grab attention and make their money. The simple truth is best captured by the Ben Graham quote at the top. Markets rise in the short term because investors are confident, and sometimes even giddy. They fall in the short term because they are uncertain or even fearful. And for the moment, investor greed has given way to investor fear. On the other hand, to paraphrase Warren Buffett, the American economy remains a strong engine of growth and over the long term will provide ample returns to prudent investors. That is the value that is weighed and that is the value that one invests in for the longer-term. Assuming one is diversified and invested prudently, the only concern should be for those funds that you expect to be spent in the coming few years. For our clients who are, or will be, withdrawing funds, we maintain a significant cash reserve precisely because sell-offs such as these are unpredictable and we do not want to have to fund cash needs by selling assets under duress. For anyone else, especially those who are accumulating retirement or other wealth, equity prices are some 10% cheaper than they were a month or so ago. They may get cheaper yet before they stabilize. But this is an opportunity to add assets to your portfolio at a lower price. I know I have written the above repeatedly over the years. Frankly, the advice doesn’t change. One of my favorite investment observers, Jason Zweig, has said he just writes the same thing over and over again, trying to keep it interesting.